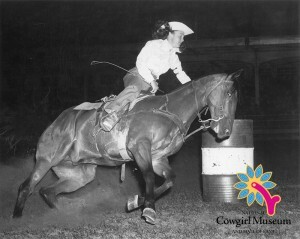 Born into a South Texas ranching family, Blanche was an accomplished cowgirl with a devotion to the sport of rodeo. A champion calf roper, she appeared at all the major rodeos in Texas, frequently competing against the men. Blanche was instrumental in the formation of the Girls Rodeo Association (GRA); she worked as association secretary and then as director to ensure the integrity of the sport and the association.